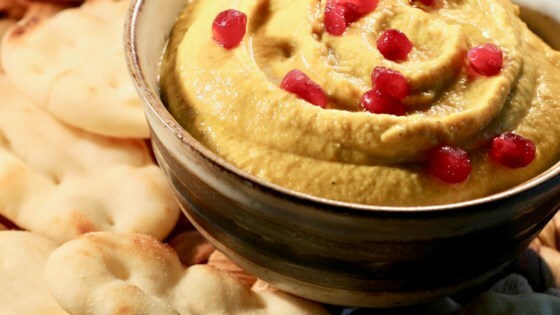 "Golden beets are slightly sweet and really enhance the flavor of hummus. Typically made with chickpeas, this hummus gets its incredibly creamy texture from white beans. Optional garnishes include a drizzle of olive oil and a dash of paprika or some pomegranate arils. Serve with raw veggies or pita chips." Quarter beets and toss in a bowl with olive oil. Place on the prepared baking sheet. Roast in the preheated oven until a knife can be easily inserted into a beet, 35 to 40 minutes. Set aside to cool slightly. Place the beets in a food processor along with the beans, tahini, lemon juice, balsamic vinegar, cumin, turmeric, sea salt, and garlic. Blend until smooth, adding small amounts of reserved bean liquid if the consistency is too thick. Transfer hummus to a serving bowl.